A NEW rig lets bikers pull-off the perfect rolling stoppie without any risk of face planting the tarmac. 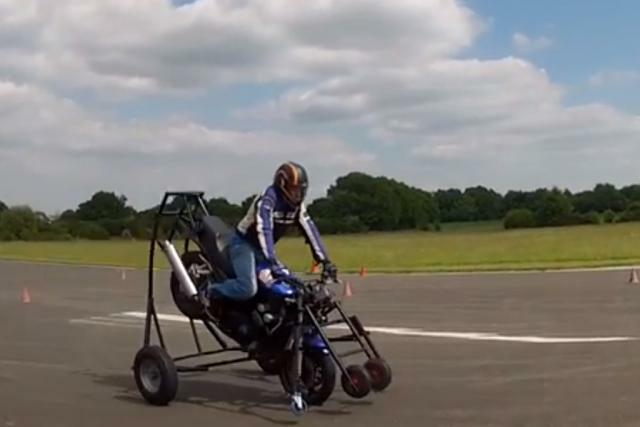 Stunt Asylum school in the UK has unveiled its latest homebuilt contraption to teach wannabe stunt riders the technique. The rolling rig is built around a Yamaha Fazer and comes with an adjustable bar to control the height the rear wheel lifts, allowing nervous novices to slowly build their confidence. It also has a set of shopping trolley-like stabilising wheels to prevent the front end from washing out under the force of sudden braking. It looks great fun and could be the answer for those who fancy themselves as the next Christian Pfeiffer but don't fancy throwing their own bike down the road. The learn to stoppie courses cost £240 from locations in Surrey and Essex and the bikes are provided. Riders will need to wear appropriate gear and show their full bike licence or ACU racing licence.